There's a downside to enjoying a cold beverage: every time you want to take a sip, you have to detach that flimsy coaster that's stuck to the bottom your glass. It's no wonder folks would rather put up with coffee table rings and mix-ups than bother keeping a set at home. It's about time coasters muscled-up. These no-nonsense, boldly designed coasters are handmade and assembled from solid, salvaged granite slabs and recycled rubber, making them the kind of sleek and sturdy piece anyone would be happy to slide beneath their favorite drink. Bottoms up! Handmade in New Hampshire. Sold as a set of four coasters. 4" squared x 1.25" thick; 2 lbs. These are really unique and 'manly' but a bit heavy for most people and they are made of a solid granite so they don't absorb moisture. Not sure how they will work for drinks but they look great and he was happy with them. Recipient raved about how sturdy & "manly" these coasters are! I have a friend who is a bit hard to buy for. I loved the title "Man Coasters" so sort of as a joke, I gave him these. They are heavy and attractive. The rubber around the edges detracts from the attractiveness a little bit but it's mandatory for non-slippage and it's thin enough to not dominate the design. My friend liked them a lot, and I will likely buy a set for myself. I did not know what to get for a guy that has everything. When I found these I knew they were the perfect gift. Then my husband saw them and he said he liked them a lot. I knew I found the perfect gift! They'll make a big hit with the men in our family. I'll put them on next year's list as well. GOOD LOOKING COASTERS, USED EVERYWHERE. WILL LAST FOREVER. These coasters are unique and attractive. Definitely masculine. Good gift for a son getting his first apartment. An inch thick chunk of granite with rubber edges and feet. These are heavy and durable - they are not a flimsy set of coasters and would probably break a glass table if you dropped one on it... but the coaster would survive intact. 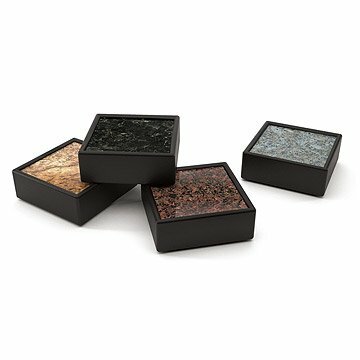 Each coaster is a unique thing, since it is natural stone, and the manufacturer used several different kinds of granite so they are a matched set by material and rubber edging but do not match *exactly* if that is important to your decor. They are also not exactly cheap, aren't something I'd want children to mess around with, or would use around glass topped ANYTHING. Handmade from solid, salvaged granite and recycled rubber, these are the kind of sturdy coasters a real man would be happy to slide beneath his drink.